An Amulet of the symbol Gye Nyame: a symbol from Ghana considered one of the oldest glyphs in human memory. Some have suggested it is at least 5000 years old. “Nyame biribi wo sor” : good things come from above. GYE NYAME: "except for God" recalls a time when none were present (pre-human history) “Except God”. This version is heavy for it's size: 1 1/4” tall with a top bail for hanging on your chain or cord. I carved layers to give depth and catch the light, giving it a Tao-like wood grain feel. Gye Nyame Amulet textured like wood grain, terraced and polished to catch the light. 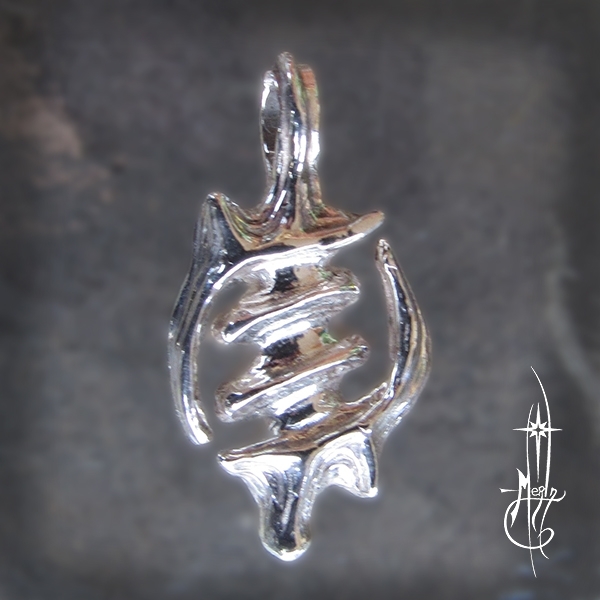 Thick and heavy for it's size: 1.25 inches Sterling silver with a top bail for your cord or chain.